Jim’s Carpet Cleaning provides high quality carpet and upholstery cleaning services to many different types of customers. Jim’s Carpet Cleaning are widely known for offering a quality service, and for being professionals who are trustworthy, honest and doing a fantastic job. This is naturally very important to our home owner customers who want the best care for their investment into carpeting their home. We are also looked to as an expert source of information and advice about troublesome areas, new carpets and stain protection options. 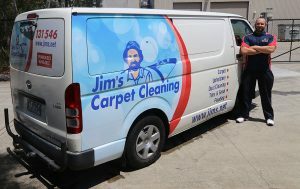 Naturally, this respect and credibility means that a Jim’s Carpet Cleaning business/franchise owner is placed many cuts above the rest by the public, and can therefore charge rates which would never be available to an independent carpet cleaner. 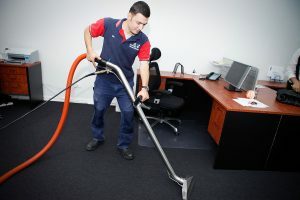 Carpet cleaning professionals provide expert care with carpet steam cleaning and stain removal, however there are also many other add-on services to ensure you are kept busy. These include upholstery cleaning and protection and leather cleaning and protection. Very often, this introduces us to clients who don’t even own carpets! Carpet cleaning is also relied on in cases of flood or fire damage, and work for both customers and insurance companies is allowed. Operators with truck mounted machines can also offer high-rise cleaning to apartments & offices. 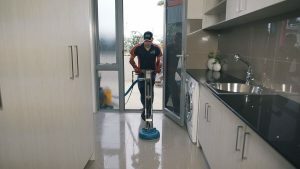 Our operators can also choose to provide a range additional services including carpet protection products (including scotch guard), carpet dry cleaning, duct cleaning, mattress cleaning, tile and grout cleaning and even pest control. All of these add-ons are as simple as getting the training and equipment and adding the service to your list in our system. Jim’s Carpet Cleaning franchisees come from all walks of life. Income can be greatly increased by the amount of effort you put in, so don’t be afraid of working! Carpet cleaning equipment can vary in cost however we do insist on a high standard of machinery. While this is an investment, the financial rewards by doing a better and faster job are higher also! Once again, franchisees with good people skills might choose to look at employees down the track so they can focus on sales. In the meantime, work is all indoors so the elements don’t affect you, and because job times are usually short you will enjoy a varied workplace almost every day. Owners can choose to focus on one or two services or offer the entire range, and can specialise in domestic or commercial or simply enjoy a balance of the two. Jim’s Carpet Cleaning are experts in their field—simply the best. Request a free info pack by filling the form below.